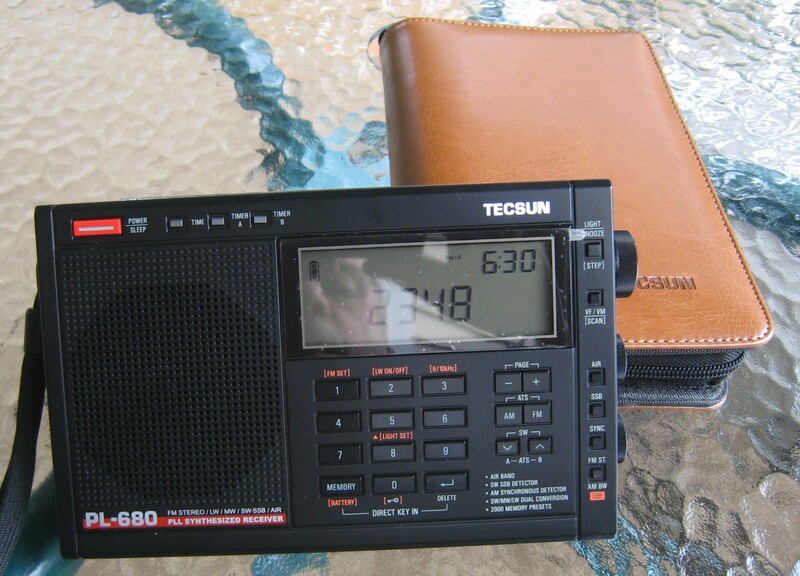 The Tecsun PL-680 is a seemingly unusual addition to Tecsun’s line. I describe it as unusual because it shares its case design with the PL-600 but has the control layout and functions of the PL-660 (click here to read the PL-660 Review), both of which are still available, along with the upscale PL-880. 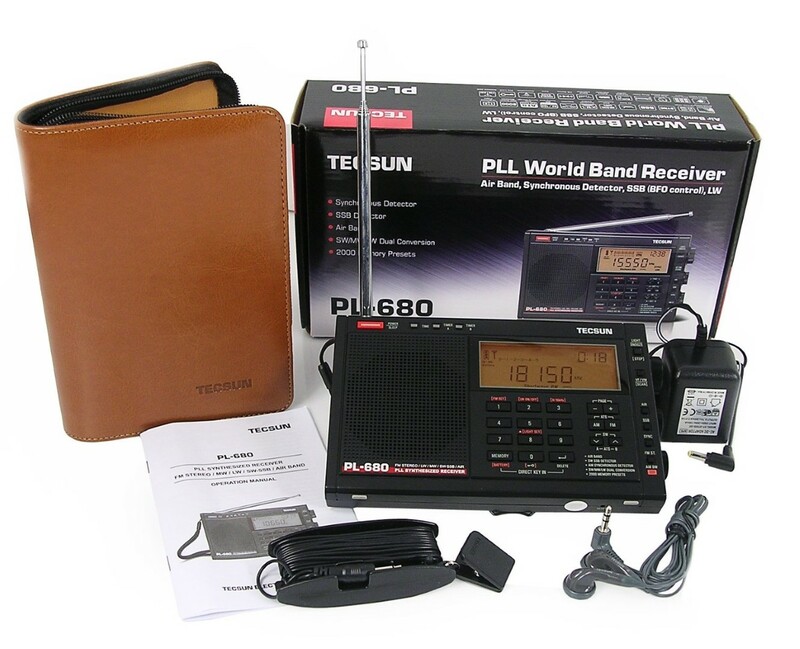 I no longer have a PL-600 but I do have the PL-660 and PL-880 so I’ll compare the new PL680 with those two radios as well as the Eton Satellit which also competes in this size/price category. As of its introduction the PL-680 was selling for $95 plus shipping. Included Accessories: Stereo earbuds, wire antenna, luxury carrying pouch, DC adapter, 4 rechargeable AA batteries (1000mA) and Owner’s Manual. 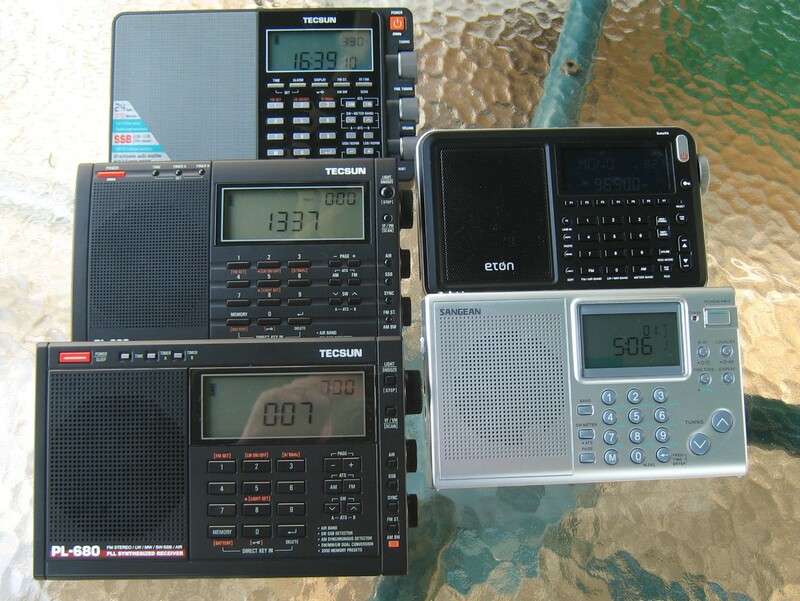 Using The PL-680: If you already own a PL-660 you will be happy to learn that the features, control functions and layout are identical on these two radios…as far as I know, this is a first – two models being so externally identical. 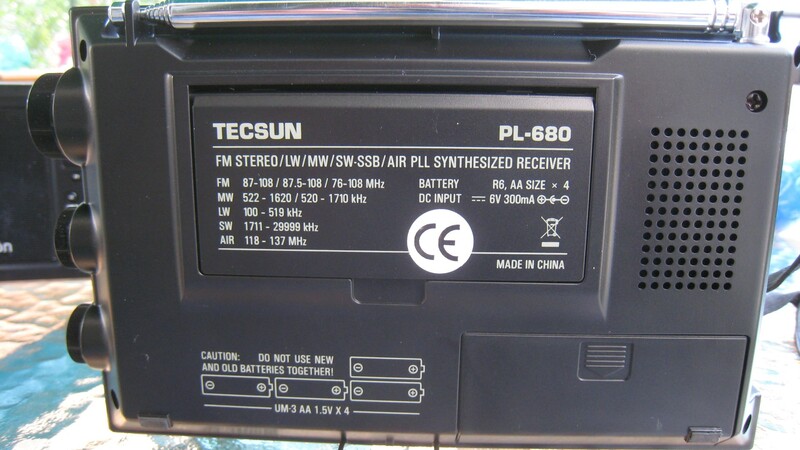 Which brings me to a question; Why has Tecsun developed the PL-680? As we’ll learn it’s not a major change in performance…there are some differences which I will point out but the 680 is what I consider to be a lateral move compared with the ‘660. So exactly what was Tecsun’s reason for introducing the PL-680? I don’t have an answer for that. If you already own a PL-660 is it worthwhile to spring for the PL-680? And between the PL-660 and PL-680 which should you buy? The answer depends on your overall priorities and which bands are of most importance to you. And how do they compare with the PL-880 and Eton Satellit? All will be revealed. Initial Checks: Of course my initial tests were to compare the PL-680 with the PL-660 and the first thing I noticed was an approximate 1 KHz readout error on my PL-680 which I had read reports about and which Tecsun has already dismissed as being within their design specifications, so don’t look for any help with that. Many samples of the older PL-660 had this offset as well although mine does not. My PL-680 reads consistently 1 KHz high on all MW/SW frequencies and this also correlates with audible center tuning as well as the center tuning spot for SSB and Sync. I have seen other reports that some samples don’t have this error so it seems it will be subject to unit-to-unit variation. It could probably be adjusted with an alignment but since Tecsun does not release service info I don’t expect any help there either. This trend of never releasing service info is galling to me and is from all accounts the result of fear of theft of designs – what a shame. I also noticed a subtle difference in the feel of the tuning between the PL-660 and PL-680…as you tune across a signal the sound changes slightly differently…perhaps a bit more abruptly with each step on the PL-680. This is not really of any consequence…just a very subtle difference I noticed which indicates that the circuits of the two radios are indeed quite different electronically. As I said, center tuning on my ‘680 is +1 KHz so my local talk station on 1080 comes in best at 1081…RHC comes in best at 6001, WWV at 15,001 etc. At least this is completely consistent across all AM/SW bands so other than being an annoyance it doesn’t affect final reception. Sound Quality: On a side-by-side comparison the new PL-680 sounds somewhat fuller and smoother than the PL-660…it is less bright and has a bit more body or warmth to the sound. This is a big difference on FM where the PL-680 sounds much more pleasing than the PL-660 which sounds somewhat peaky and shrill by comparison. On AM and SW the difference is not as big but it is still there…you’d have to hear them side by side to initially notice this. But on SW signals that are less than perfect the PL-680’s smoother sound makes less-than-perfect reception sound more listenable. It doesn’t quite match the sound quality of the upscale PL-880 but it is a nice improvement over the PL-660 and approaches the sound quality of the Eton Satellit. MW (AM) Reception: Being an admitted AM junkie this was the first band I checked. I was disappointed that the PL-680’s AM is less sensitive than the PL-660 which means medium to weak stations are received with more circuit hiss…if a station is weak and/or far away, it sounds weaker or further away on the PL-680. Adding to the insult is that AM is the weakest aspect of the PL-660’s performance and it is therefore not one of my favorite AM portables…it is relatively noisy on AM so I have to rate the PL-680’s AM as mediocre to fair at best. My 60’s vintage Zenith Royal 500H slaughters it on AM. A bright spot is that digital hets and birdies are relatively few on the PL-660 and PL-680 although the oft-reported spurious signal between 950 – 1000KHZ is there on both models. It falls at 970 on my PL-660 and 960 on my PL-680. With an external antenna such as a loop the PL-680’s AM is much more listenable but as a portable this is not a radio for AM lovers. SW Reception: Here the news is somewhat better. I had read of improved SW sensitivity on the new model but as I compared the PL-660 and PL-680 on weak to medium strength SW signals I was hard pressed to note much difference between them at all. What small differences I could hear seemed to vanish when I swapped the positions of the radios…they were so close that positioning caused more differences that that inherent in the radios themselves. I tuned to some weak and fading signals which were disappearing right down into the band noise then fading back in and with my head right between the two radios they seemed to track very similarly. Sometimes one seemed a hair better than the other, but then these apparent differences would reverse when I moved the radios a bit so I was not able to say that one was better than the other. Certainly any differences were much smaller than what you might gain by moving the radio a few inches or adding even a short wire antenna to either radio…insignificant. This is a good result because the PL-660 has earned a reputation as a great SW portable in this size/price range …the PL-680 is just as good on SW but I did not find it to be better. However I have to point out that the improved audio of the PL-680 made it more listenable with less-than-perfect SW signals…less treble peakiness and a fuller, warmer sound are definitely conducive to a better SW experience. I later compared their SW performance at night and although there were many more signals at higher levels the two radios still behaved so similarly it was hard to pick either one as better. On signals that faded right down to nothing each radio lost audio simultaneously and regained audio at the same time. Signals that were barely readable were identical and stronger signals that were still a bit noisy were received with the same signal to noise ratio The signal meter reading was always higher on the PL-680 which clearly was over-reading…readings on the PL-660 seemed more in line with what I was actually hearing. I also listened for differences in AGC characteristics which affect how stable the audio is when signals are fluttering and wavering. Again, the two radios behaved identically in this respect. Synchronous Detection: During these comparison tests I also compared the sync performance on the two radios. With the exception of the fact that the PL-680 had to be tuned 1KHz high on the display for the signal to be properly center-tuned I found the sync performance to be indistinguishable as well, both day and night. Overall sync performance is superb for this class of radio. Both of them can lock onto virtually any signal you can hear and do not seem to lose lock except under extreme fades. Signals can often fade right down to the noise level and still remain locked. When signals faded completely out both radios seemed to lose lock at the same instant and regain lock at the same time as signals faded back in. The sync also helped with intelligibility on very weak signals lifting the audio up out of the mud. Here the two radios have one up on the PL-880 whose sync is useless due to poor design. SSB Performance: I found the PL-680’s SSB to work well, just as with the PL-660. Once I had the signal properly tuned the SSB knob generally ran quite close to its center detent position and I was able to get natural sounding voices most of the time with little effort. The SSB on the ‘680 shares an oddity with the ‘660 in that if you turn the SSB knob fully clockwise the audio drops out to nothing. Given that this quirk is inherent in the design of both the PL-660 and ‘680 and does not affect the ability to get good SSB reception it’s not a matter of concern…just something to be aware of. Soft Muting: Although much was written about the PL-660’s soft muting I’ve always found it to be rather subtle compared with many other current radios and I’m finding the same is true with my PL-680. Generally I can listen as signals fade right out to nothing and they do not seem to mute, although at other times the volume does seem to pump just a bit at very low levels. I also see no signs of soft muting as I off-tune away from center tuning…most radios with soft muting drop the volume noticeable as soon as you tune off by even one increment. Soft muting seems much less evident on the PL-680 than on most radios so even though I think it should be done away with completely I am not going to complain about it this time. FM Reception: Again, the older PL-660 is what I would describe as an excellent FM receiver…it has excellent sensitivity and selectivity and is close to the very best I have seen…the PL-680 is just as good. My hillside location gives me interesting but always changing reception from several states and the PL-660 and ‘680 are superb at separating closely spaced stations, and even receiving up to three signals on one frequency by moving the radio or its antenna. At the current state of the art this is just about as good as it gets for FM reception. If you already own a PL-660 I wouldn’t spring for the PL-680 unless you are dissatisfied with the sound of the ‘660. And definitely don’t buy the ‘680 for its AM which is noisier than the ‘660. But all in all I think both of these are fine radios with superb FM and SW, SSB and Sync. If only they had improved the AM instead of making it worse this would be an unqualified rave review. As it is, the PL-680 is still a fine radio, but not for AM lovers.